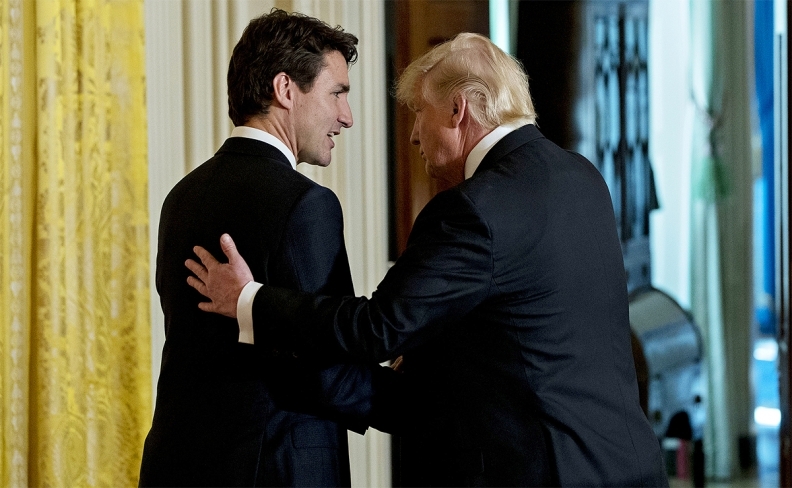 OTTAWA -- The Canadian government is taking a measure of comfort in a new report by the U.S. Congress that casts doubt on one of President Donald Trump's priorities for renegotiating the North American Free Trade Agreement, The Canadian Press has learned. The Congressional Research Service says in a report issued last week that there is no clear path for Trump to reduce the U.S. trade deficit with Mexico, one of his major complaints and an overarching priority for revamping a pact he has repeatedly threatened to tear up. The report emerged just as the fourth round of NAFTA talks was ending in Washington, exposing for all to see the massive gap between the negotiating parties on most of the major issues, including autos, dairy, the pact's enforcement mechanisms and a controversial U.S. request for a five-year sunset clause. A senior Canadian official, speaking on condition of anonymity because of the sensitivity of the talks, said the report is an affirmation of everything the government has done to lobby Congress on the merits of the deal and its open trade flows between the two countries. The report, the official said, will serve as a reminder that there are many in the United States who agree with improving and modernizing the trading relationship with Canada, and that Congress will have a major say in the future of the deal. Canada maintains it does not have a trade surplus with the United States, a point Foreign Affairs Minister Chrystia Freeland routinely uses to illustrate her point that it's not a good way to measure the success or failure of NAFTA. The congressional report appeared to concur. "Economists generally argue that it is not feasible to use trade agreement provisions as a tool to decrease the deficit because trade imbalances are determined by underlying macroeconomic fundamentals," says the 37-page report. It suggests using NAFTA to strengthen the Mexican economy to boost imports from the United States. Trade balances, it notes, are "incomplete measures" of a trading relationship. "It is not clear how the (U.S.) administration would expect to reduce the trade deficit through the renegotiation." The Trudeau government has embarked on a comprehensive lobbying effort among members of Congress — as well as focusing on key U.S. states — to make the case that the free flow of goods between the U.S. and Canada is good for jobs on both sides of the 49th parallel. Last week, Prime Minister Justin Trudeau appeared before the House of Representatives Ways and Means committee, which oversees trade negotiations. The government has frequently reminded the United States that 35 states and nine million American jobs depend on trade with Canada. It has touted the tightly intertwined supply chains across the U.S. auto sector. The congressional report says the auto industry is a significant source of U.S. jobs, while NAFTA was instrumental in the development of North American supply chains. "New tariffs or trade barriers have the potential of disrupting these supply chains, which could raise costs for U.S. consumers and possibly make goods and services produced throughout North America less competitive in foreign markets," it points out. The latest round of NAFTA talks ended Tuesday on a decidedly frigid note. "Frankly, I am surprised and disappointed by the resistance to change from our negotiating partners," said U.S. Trade Representative Robert Lighthizer, flanked by his Canadian and Mexican counterparts. Freeland, for her part, said the Canada-U.S. trading relationship is "very well balanced and is mutually beneficial." She said when goods and services are counted together, the U.S. runs a "slight surplus" of $8 billion. "Canada does not see a surplus or a deficit as the primary — or even a very important — way of measuring the value of a trading relationship," she said. The report also suggests the U.S. could inflict damage in broader areas of three-way co-operation, including on security co-operation. "The United States shares strong economic ties with Mexico and Canada. Any disruption to the economic relationship could have adverse effects on investment, employment, productivity and North American competitiveness," the report states. Since 2005, the three countries have also made strides on economic and security co-operation, through the North American Leaders Summit — sometimes called the Three Amigos — which began under former president George W. Bush, the report says. "The outcome of NAFTA renegotiations has the potential to affect progress made over the past decade in regard to security, competitiveness, and issues of mutual interest."